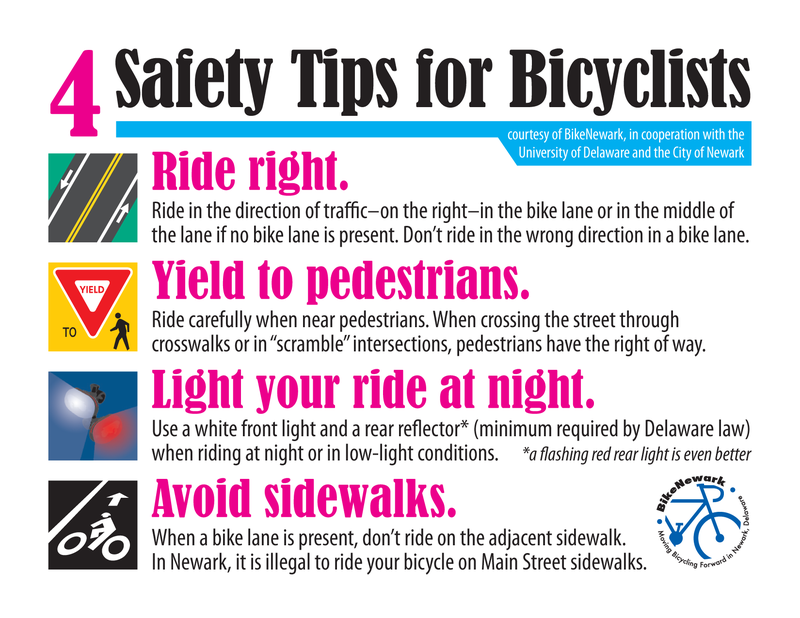 It’s National Bike Month, and these are certainly heady times for Newark. While we await word from the League of American Bicyclists with regard to Newark’s redesignation as a “Bicycle Friendly Community,” the national organization People For Bikes just released its rankings for cities based on five criteria—ridership, safety, network, acceleration, and reach—and Newark is ranked 7th among cities with populations under 100,000—nationally. Whereas this is exciting in a certain sense, the overall rating was only 2.5 out of a potential 5.0. Of the five criteria used, Newark’s highest ranking was for acceleration—“how quickly a community is improving its biking infrastructure and getting people riding.” What People For Bikes picked up on is that, while Newark is certainly not yet a bicycling haven, there is a lot currently being planned that will improve, dare I say transform, Newark in terms of mobility for bicyclists. If I remember my Latin correctly, the root of the word “transition” is the verb transire, which means “to go through or beyond.” With major DelDOT paving-and-rehab projects scheduled over the next several years—Main Street, Delaware Avenue, Cleveland Avenue—Newark will indeed be in a period of transition. And, just like the current condition of Main Street, the road ahead will be bumpy. 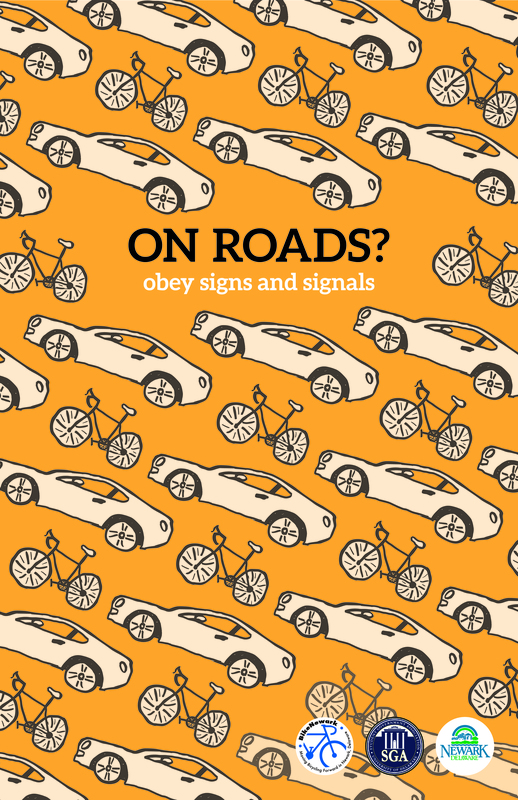 Main Street will have a new look and a surface that should weather better than in the past, including greenbacked sharrows to draw the attention of and better attention to bicyclists. A repaved, redesigned Delaware Avenue will feature a two-way, protected bike lane on its north side from Orchard Road to the Pomeroy Trail and bike lanes on either side of the road from there to Library Avenue. The length of the repaved Cleveland Avenue will feature bike lanes on both sides of the road, owing largely to the removal of on-street parking (in 2017) and reconfiguration of the segment between Chapel Street and Capitol Trail (Kirkwood Highway). The new train station will be completed, which will include sheltered parking for 60 bikes. The University of Delaware’s STAR Campus will have seen further development and build-out, with bicycle infrastructure. The University will have added a few new buildings adjacent to or near South College Avenue and the South College Avenue corridor will probably be scheduled for paving and include new bike amenities. Progress will be well underway for the Charlie Emerson (bike/ped) Bridge over White Clay Creek near Paper Mill Road. Hopefully, by then, a citywide bicycle network will also have been identified and marked with wayfinding/destination signage. Progress doesn’t happen often without pain, though. 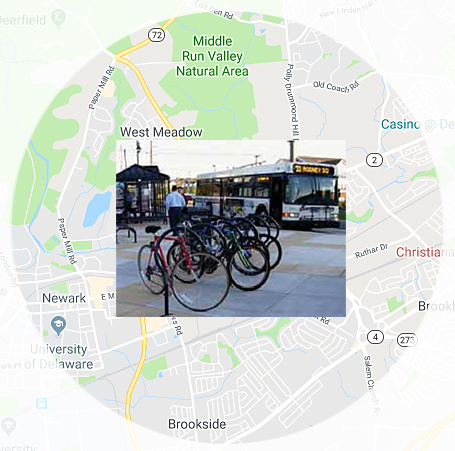 And, despite what we will have “to go through” to see these improvements in transportation infrastructure, BikeNewark continues to advocate for Newark “to go beyond” where it has been in terms of bicycling. What has made other cities—university cities like Ft. Collins, Colo. and Davis, Calif.—so successful, though, is that their citizenry, municipal government, and business community have all embraced a culture of bicycling. The benefits of a community that has embraced bicycling are clear—better overall health and wellbeing, a cleaner environment, a more vibrant economy—in short, a place where people want to live, work, and play. Mitigating traffic volume and improving parking seem to be universal concerns here in Newark, particularly within the downtown business district. Promoting bicycling as an important mode of transportation and an alternative to the car is one important puzzle piece in the overall solution to these problems. I imagine a Newark in which a much larger segment of the population uses the bicycle as basic transportation to get from place to place within the city. We who do use a bike for reasons other than recreation understand the convenience of traveling on two wheels under our own power. 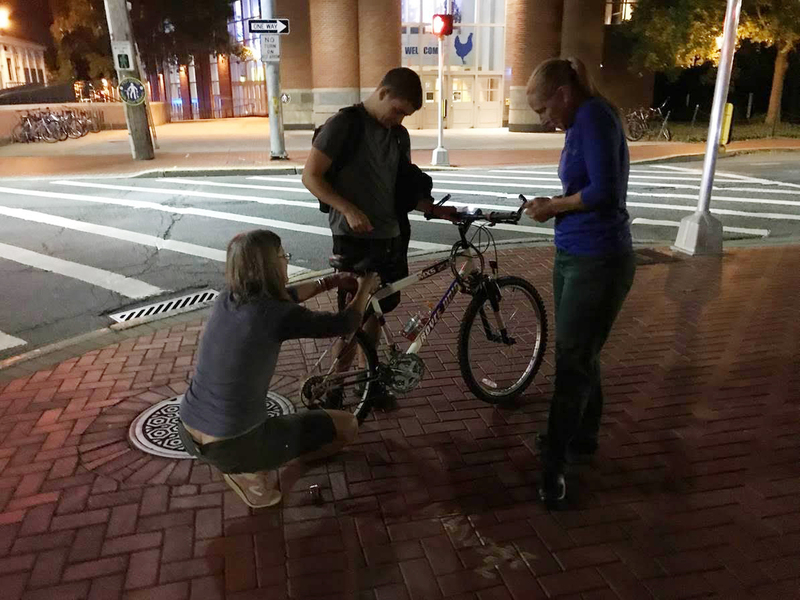 Creating better overall conditions for bicycling—developing a low-stress bicycle network, reducing conflicts between cyclists and pedestrians/cars, educating the public about good cycling behavior, and encouraging more people to get out on their bicycles—is what BikeNewark seeks to do. In other words, moving bicycling forward in Newark, Delaware. I am blessed to have worked over the past eight years with people who genuinely care about Newark and improving conditions for bicycling throughout the city. In 2017 we took the bold step of reorganizing the former Newark Bicycle Committee as BikeNewark, a Delaware nonprofit corporation. But now BikeNewark is also in a period of transition. Like a flower that has been planted and has quickly pushed up through the surface and blossomed, BikeNewark now needs to be maintained, well fed and watered, so to speak. As BikeNewark grows, we are looking for individuals—residents and non-residents alike—and business partners who are passionate about advocating for a bicycling culture and bicycling improvements within Newark and are willing to work cooperatively with others who are likewise motivated. If this is you, please get in touch with me and do get involved. As I tell folks from our partner organizations, we are all working for the same goal—to make Newark the best community it can be for all who live, work, and/or go to school here, and for whom it is a desired destination. 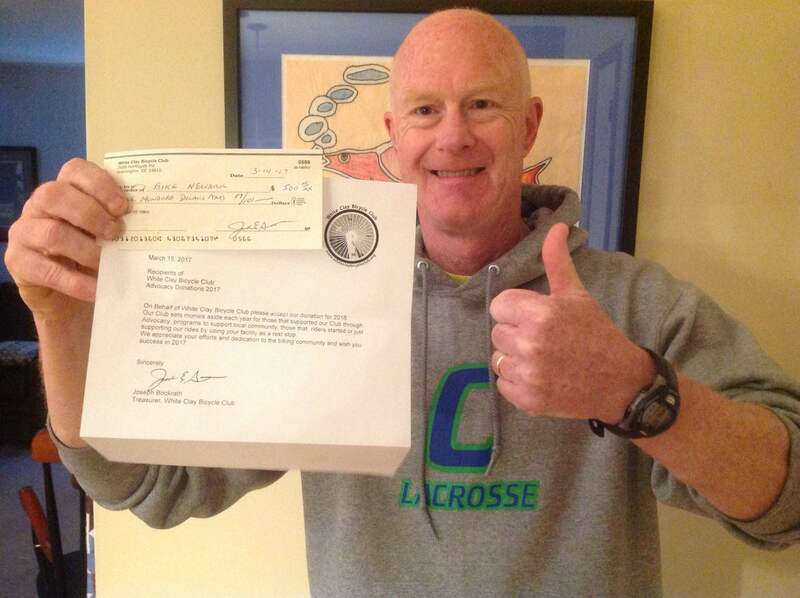 Mark Deshon is the current Chair of BikeNewark and has resided in Newark since 1987.